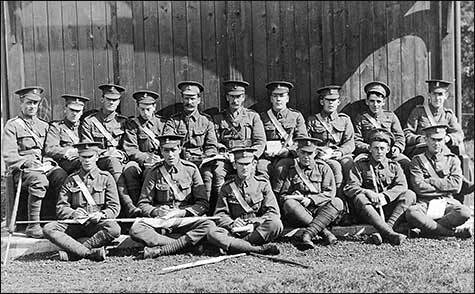 The advance guard, about 170 strong, of the 1st Welsh Regiment, arrived in Higham this afternoon by the 2.10 train. They are the first complement of a company of 3,000 who are to be billeted in Rushden and Higham Ferrers. Soldiers Reach Rushden - Thousands of ‘Em - Croesaw I Cymru! “Croesaw I Cymru” was Rushden’s motto yesterday when the men of the 158th Brigade marched into the town where it is hoped they will be quartered for a few weeks. “Indeed to goodness” but the men presented an imposing appearance as they marched through the High-street headed by their bugle band, and every man was the picture of health, look you. 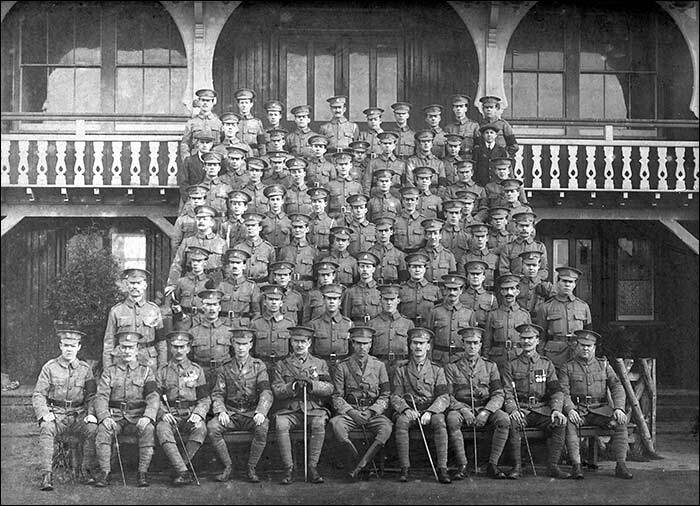 The brigade comprises the 5th, 6th, and 7th battalions of the Royal Welsh Fusiliers, and there are two companies of the 1/1st Herefords with their A.S.C. Brigadier-General F. C. Lloyd is in command of the brigade, and his staff comprises Capt. R. L. Lloyd (Brigade Major) and Capt. Stanley Davies (Staff Captain). Colonel Phillips commands the 5th battalion, Col. Jones the 6th, Col. Jeff Reveley the 7th, and Col. Drage the 1st Herefords. Other officers in command of the various battalions are as follow: 1/1st Herefords, Major Carless, Captain Nott (adjutant), Capts. Holman, Yates, Green, and Rogers; 1/7th R.W.F., Major Owen Owen, Capt. Beadon (adjutant), Qtr-Master E. Baston, Capts. Lloyd Jones, Gordon Reed, C. C. Jones, Wynne Williams, and A. M. Jones, with Capt. J. A. Davies (medical officer); 1/6th R.W.F., Lieut.Col. Jones, Major Wheeler, Lieut. Porter (adjutant), Capt. Armstrong (Quartermaster), Major Jones (medical officer), Capts. Griffiths, Jenkins, Battersby, Davies, Miller, and Mills. The Queen-street schools have been requisitioned as the head-quarters and quartermaster’s stores of the 6th battalion, and the Vestry Hall as the headquarters of the 7th battalion, which has for its quartermaster’s stores the B.W.T.A. Hall. 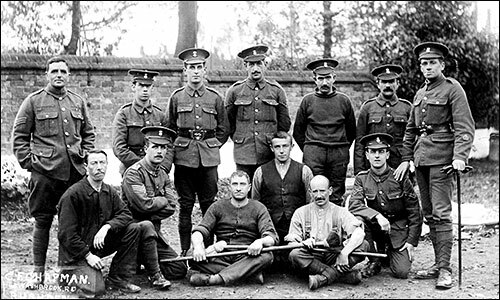 The men, who have all volunteered for foreign service, left Bedford yesterday at 9 a.m. and arrived in Rushden about one o’clock. 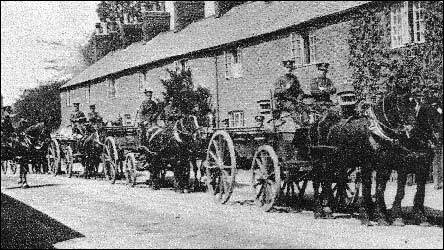 The 5th Battalion are quartered at Higham Ferrers. The Herefords have with them their regimental mascot, a bull-dog named “Buller,” and accompanying the 1/7th R.W.F. is the regimental goat “Billy,” who looks very smart with his gilded horns. “Billy” has come with his friends all the way from Wales and so far has accompanied them wherever they have gone. We are asked to state that although the goat is named “Billy” he emphatically disclaims any connection with the Kaiser, although, like his namesake, he has the habit of sometimes butting in where he is not wanted. Four battalions of the R.W.F. are, we understand, already at the front. The men who are now quartered in Rushden have thrice been billeted at Northampton and twice at Cambridge. They marched to Bedford from the latter place, staying in St. Neots for the night, and they have been in Bedford for the past week. We are pleased to see them in Rushden and we are sure that the townspeople will give them the generous hospitality they all deserve, for indeed to goodness, they are a nice looking lot of boys whatever. The Queen Victoria Hotel is the headquarters of the Brigade. A comfortable institute for soldiers had been established in the Old Top Meeting by members of Park-road Baptist Church. There are four rooms for the following uses:- Primary department, games room; Old Chapel, gymnasium; No. 1 Young Men’s Bible Class room, reading and refreshments; No. 2 writing room, Billiards, bagatelle, draughts, dominos, etc., are provided, and on the first night of their arrival the men were eager to take advantage of the privilege so thoughtfully offered them. Refreshments are provided at a nominal charge. A working committee is to be constituted. In the gymnasium are horizontal and parallel bars, dumb-bells, etc. There is a good variety of periodicals in the reading-room, and pens, ink, and stationery are provided in the writing room. There is also a box in which the soldiers may post their letters. 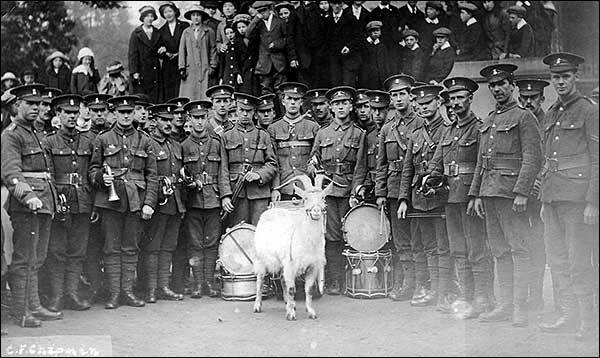 The Bugle Band and The Welsh Goat "Billy"
There is a society among the Herefords at Rushden called the ''Angels." To qualify for angelic brotherhood, we learn, one must have at least done three days "C.B." The "Angels" are musically inclined, and give al fresco concerts. The initial programme could not take place on Thursday, for the weather was such that it made the ''Angels" swear. The Royal Welsh Fusiliers have the regimental white goat with them, and the Herefords affect a bulldog. A schoolroom of the Independent Wesleyan Church was arranged as a reading and recreation room, but it was required for military purposes. Two of the Welsh were conversing in their native tongue, and a dear old lady remarked, "My! what terrible bad language!" "What a fearful lot of brothers there are!" exclaimed one lady to another as she observed the ''Owen Owen's," the "Lloyd Davies's," and the "Morgan's" placed in the billet windows. At the ''Old Top Meeting," Park-road, a soldiers' institute has been formed, in which there are games, gym., reading and refreshment, and writing rooms. Billiards, bagatelle, and other table games are provided, and greatly appreciated. On Sunday Church Parade was the general order for the troops at Rushden. The Parish Church of St Mary's was crowded, and an overflow service was held in the Rectory grounds. There was also a service at St Peters Church.A service was arranged to be held at the Park-road Baptist Church, but through lack of knowledge of the local topography the soldiers marched into the Wesleyan Church, Park-road. The Rev. R. Heaps was sent for, and he arrived and gave a short and appreciated impromptu sermon to the men. The Congregational Church was also to have received a visit from the Welsh Cogreationalists, but through some mistake the order was not carried out. The troops attended the Sunday band concerts in Spencer Park in large numbers, and gave a very beautiful vocal programme between the band items and after the band programme. Three soldiers at least broke bounds on Sunday and went to Northampton to see friends. Coming back in the ’bus they entertained the other passengers. One was "fairy sleepy," and the other two were less sleepy but more or less merry. The two "merry ones," with noisy secrecy, plotted to "get a bob out of Tweedledum.'' Said one to the sleepy man, "You're no right here. You're been to Northampton. You're broke bounds, you have, Tweedle-dum." Then, in a loud, confidential whisper: "We'll make it all right for a bob, won't we, mate?" The sleepy one slept on, and the merry ones looked pained. ''Look here," they said, "do you want to go before the C.O. in the morning? Where's your pass? You hadn't ought to be in the vehicle. Put it right for a bob. We've been sent for you.'' But still the sleepy one slept on. When at length they got him roused he told them straight he had as might right there as they had. More in sorrow than in anger they reprimanded him. "Looky, mate, it'll cost you more than a bob if you have any cheek. We're M.P.s; We're bin sent for you," they assured him. But though they threatened, cajoled, flattered, and pleaded, they could not raise a "bob." The Welsh goat is a queer beastie. The youngsters were feeding it on Sunday with cigarette pictures, and it has a voracious longing for "Woodbines." One "Tommy" said to it: "Here you are. Here's a love letter. That ought to make you bad." But the goat ate without a blink. We learn the Welsh are very proud of their goat. It is extremely intelligent and never forgets a friend or forgives an enemy. Its liking for cigarettes does not include lighted ones, as one soldier found to his cost. Whenever'"Billy" sees that soldier, whether on the march or "off duty,'' he endeavours to mortally wound him. On Monday a large number of musical Welsh soldiers assembled at the "Oakley" (not inside) and gave a concert. It was well attended and a splendid programme was given. The Y.M.C.A. has sent a representative from Northampton and arrangements have been made to entertain the soldiers from time to time. The Waverley Hotel is the headquarters. The similarity of names resulted in a queer mistake at a billet recently. A soldier returned home one evening and found a note on the table. "Dear Jack,” it read, "you will find some ham and coffee for supper. Come up quietly to bed, and don’t wake the boy." The soldier’s name was "Jack," and he enjoyed the hospitality. The husband’s name was "Jack." He came home later. What he Thinks of Us - A Private in the 7th R.W.F. Writing to a Llandyssil friend – says the Montgomeryshire Express” - Pte. J. W. Sumner of B.Company, 7th R.W.F. at Rushden, describes the battalion’s departure from Cambridge. “We left” he says, “in full marching order, with rifle and equipment, each man bearing a total weight of between 60 and 70 pounds for St. Neots, Huntingdonshire, 19 miles on a hot day. Hundreds fell out on the way. Next day we marched to Bedford, the town of John Bunyan (his chapel is up still) a distance of 13 miles. This time 400 fell out – 64 out of our own battalion. You can form some idea of this when you consider that the whole division reaches eight or nine miles along the road. We were trudging and trudging mile after mile under the bleaching sun. this is my first march with ammunition on me. Two men died on the road and several were very ill; it was killing, but I am thankful to say I held out all the way. Now and then when they halted us in Bedford we would fall or squat in the streets, anyhow. I don’t think we could have gone a mile further. Many of the men showed splendid grit, even with bad legs and sore feet. The hot sun peeled the skin off our faces and we could not quench our thirst. Now we are not allowed to drink except when ordered to do so by the commanding officer. Last Thursday we left Bedford for Rushden, 13 miles away and it rained on us for about 12¾ miles. We had our packs like camels’ humps on our backs and our overcoats on top. We were laughing at each other and the people in the street laughed at us. We looked fine figures I can tell you and over eight miles of us. We cannot say how long we shall be staying here. The people of Rushden have not been visited by soldiers before, and they are so proud of us I believe they almost worship us and they are ready to do almost anything to make happy our short stay. On Sunday we paraded at the Wesleyan Chapel to the number of between 400 and 500. In the afternoon I went to Sunday School; I have always attended Sunday School since I left the dear little old Sabbath School at Llandyssil. After the night service at chapel the members very kindly gave us a sacred concert and free refreshments. We were having our food on the streets when we first came here and it was a sight to see us; the people enjoyed the spectacle and we enjoyed the fun. Now we have every meal brought round to our billets. We don’t know the day or hour we may be called upon to leave the country; we may stay here some time, but we cannot say how long or where our next destination will be. R.W.F. Signallers met the Rushden Baptists at cricket on Saturday, the Baptists winning easily. Scores:- R.W.F. : Corpl. Webb, c Wright, b Hilton, 0; R. F. Downing, c Allen, b Hilton, 0; L. Evans, b Hilton, 16; Lance-Corpl. W. Lloyd, b Owen, 9; A. Edwards, c Owen, b Pennington, 5; T. Field, b Owen, 8; A. Holborrow, st Wright, b Pennington, 1; Corpl. Owen, c. Wright, b Pennington, 0; Corpl. Thomas, b Pennington, 1; Webb, not out, 1; A. P. Layer, b Pennington, 0; extras 10; total 51. Baptist: W. E. Owen, not out, 27; T. Pennington, not out 58, extras 2, total (for no wicket) 87. A.Ablett, J. Willmott, W. Freeman, S. C. Brightwell, L. Allen, S. H. Wright, T. Hilton, F. H. Linnitt and E. Wright did not bat. Corpl. Jones, R.W.F., sang “Land of hope and glory” and “The way of heaven” at the service in the Independent Wesleyan Church on Sunday evening. The Rev. C. J. Keeler was the preacher for the day. Acting-Sergt. T E Pennington, of the 6th R.W.F., who was billeted with Mr A Ablett in Robinson-road, Rushden, writes that he was wounded in the left leg on August 12th, and was taken to Malta. There he had a severe attack of dysentery and nearly died. We are glad to learn that he is rapidly improving, although still confined to bed. It will be remembered that Sergt. Pennington was a very clever billiard player, and won several handicaps whilst in Rushden. Pte. George Davis, Newtown, has died from appendicitis at the Prees Heath Camp. Pte Ellis Jones, who was billeted with Mr Hall, grocer, Rushden, is in Manchester Hospital. He has had both feet amputated. Major Williams, 7th R.W.F., who is home on leave from Egypt, is now staying with Mr and Mrs W W Smith, of Leamington House, with whom he was billeted whilst in Rushden. Private William Parry, Carnarvon, who is serving with the 1/6th R.W.F. in Egypt, says:- "It is very hot out here: it is 104 degrees in the shade. I am away from the battalion for a while working on a railway just for a bit of a change. We are by the Suez Canal now. I have been bathing there three or four times. I took a stroll the other night to see the place where the Turks tried to get over. We saw heads, legs and arms lying about. It was dreadful. We had a visitor here the other morning and he managed to drop some pills (I mean bombs). He came pretty close to our camp. All the Carnarvon boys are together". Sergt. George Langton, Carnarvon who served in the Gallipoli campaign, and lately in Mesopotamia, where he was wounded, arrived home in Carnarvon this week. Pte. S.T. Morgan, Portdinorwic, who served throughout the Gallipoli champagne has been invalided home. Ptes. R. Owen Jones and E. W. Jones (Bala) have qualified as bomb throwers. Sergeant David Jones married Sarah Holiday at St Mary's Church, Rushden in 1916. Extract from a longer article Nov 1916: Mr. Button met on board his ship some of the R.W.F.’s who had been billeted at Rushden. They had been wounded at the Suvla landing, and his ship was taking them back to Egypt to rejoin their units. He spoke to several of them and they were all loud in their praises of Rushden, and said that the first place they would visit on their return to England would be Rushden. Major T H Parry, M.P. for Flint Borough, who was recently billeted in 1915 at Higham Ferrers, is reported wounded a second time. It will be remembered that he was invalided home from Gallipoli with a wounded foot. 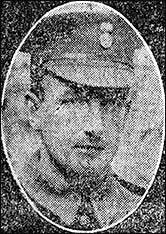 News has been received that Sergeant Catherall, Royal Welsh Fusiliers, who was formerly billeted with Mrs. Sanders, 9 Wellingborough-road, Higham Ferrers, was killed in action on March 25th, evidently in the battle of Gaza, in the East. The deceased sergeant was 22 years of age. the landlord of the Wheatsheaf Inn and later, by Mr Sartoris at Rushden Hall. a carved goat's head added to Old Grammar School building in memory of Billy. Among the collectors of revenue at the fete was a large white "Billy" goat with gilded horns. The animal was led about by Mr. "Roddy" Ripley, the eighteen-year-old son of the late Colonel Ripley, who "pushed" his collecting box among the visitors with determined persistence. The goat was the mascot of the Royal Welsh Fusiliers, and when the regiment went out to the front it was provided with a good home at Rushden Hall, where Mr. Sartoris has kept it ever since. Bugler Killed – Many Rushden residents will hear with keen regret of the death of Bugler Vaughan Williams, late of the 7th R.W.F. Bugler Williams was billeted with Mr and Mrs C Lingard during the war, and afterwards saw much fighting with the R.W.F. He was riding a motor-cycle recently in Birmingham and met with an accident which proved fatal. The parents of the deceased had both been dead some time. The father was the late Rev. Williams. He leaves a wife, but no family. Mr Williams was one of the most expert with a bugle.